The hardest part of open-world games, for me, is paying attention to the plot instead of getting distracted by all the places I can go. Recently I’ve spent about 30 hours in 2012’s Sleeping Dogs and have barely gotten out of the intro missions. I have, however, found the world’s longest escalator system. Sort of. It seemed like a notable Hong Kong landmark, or at least a major pedestrian hub—exactly the kind of thing you’d expect to find in an open-world game that tries to simulate city life. 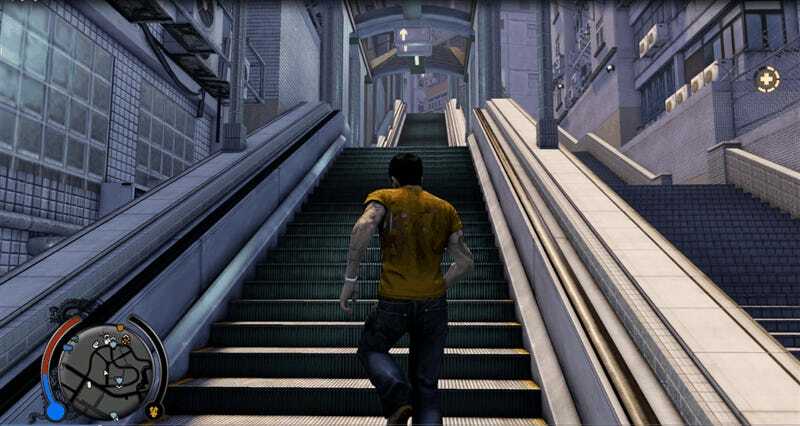 Some cursory research via wikis assured me the escalator actually existed, at least in part, in Sleeping Dogs. As Rob Rath pointed out, Sleeping Dogs’ Hong Kong has shrunk and distorted its landmarks, so I didn’t expect the escalator would be as long as it would in real life. Instead of being disappointed by a potentially rinky-dink virtual landmark, I decided I’d turn the whole thing into an adventure by finding the escalator using real world maps instead of looking up its location in-game. I opened up some Hong Kong tourist information and compared it to Sleeping Dogs’ map. They didn’t quite match up. Undeterred, I even dressed for the occasion. I don’t have enough Face to wear some of the cooler clothes I’ve found, but I did what I could. I’m pretty proud of that knock-off designer watch. I’d read that in the real world there’s an on-ramp to the Central-Mid-Levels escalator from a mall in Central, which I thought I’d seen on one of my previous drives through the area. So I set a waypoint on my map, grabbed my bike from the parking garage, and headed out. 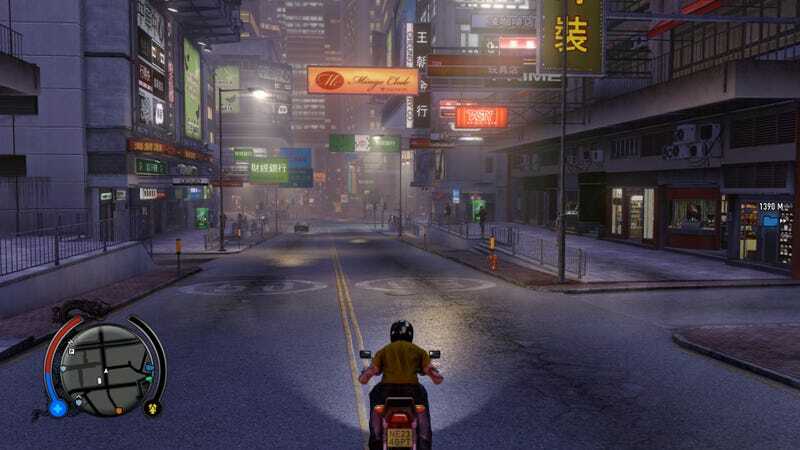 I tend to not be a big fan of driving in games (I am, both in games and in real life, a pretty terrible driver) but I’ve driven huge swathes of Sleeping Dogs’ map in my plot-ignoring wandering. The cars and bikes feel like they have suitably different weights, and I love the broad, winding highways. They’re easy to cruise through, and more often than not I find myself emerging at far ends of the map, wandering into places I shouldn’t wander and punching dudes I shouldn’t punch. On my way to Central I shot through cars, following familiar roads and darting along new ones, constantly forgetting to drive on the correct side of the road and rocking out to the game’s excellent soundtrack. It was a good start. When I got into Central I tooled around for a while looking for something that seemed big enough to be a landmark. Along the way I accidentally veered onto the sidewalk, hit a pedestrian in front of a cop, and a chase ensued. I employed some expert evasive action. I managed to shake the cops and parked my bike, figuring I’d have better luck if I didn’t have to worry about keeping my eyes on the road. The nighttime streets were bright and busy, and I wandered around with my head craned to the sky, looking for anything that might resemble a model of a really long escalator. There were some walkways and overpasses, but nothing distinctly impressive. Of course I wasn’t quite sure what I was looking for, nor how it would be presented in the game. I saw some thugs hanging out by an armored truck, guarding something. I took a brief detour to mess with them. I’ve done way more karaoke than I’ve done fighting, and the thugs were not keen to give up on their loot. It didn’t go so well. I don’t know why I’m not facing the guy attacking me either. I eventually ran off and left the thugs to whatever they had decided to wear suits to loiter around. While I walked away, nursing my wounds, a man snatched a woman’s purse. Surely I could handle this. I took off in pursuit. Feeling guilty, I waited around until the paramedics came. They promptly declared him dead, which seemed like an over-reaction. I slunk into the shadows before anyone could pin it on me. Moments later another woman’s purse got snatched. I raced after my chance at redemption. This act of heroism went a lot better. I got the woman’s purse back, and I didn’t even kill that guy. The chase led me toward the white walkway you can see above. Was it the Central-Mid-Levels escalator? Had my good deed been rewarded? This is not an escalator. I didn’t really know what I was looking for, but I figured even a scaled-down model of a major pedestrian escalator would have to have, well, an escalator. I stood at the rail and scanned the skyline. The city bustled and hummed below me. Cars honked, people yelled, and signs glowed. The paramedics drove off with the body of the man I’d killed. I headed out again, reinvigorated. I tried different disappointing stairwells and overhangs. As I passed through a crosswalk, there was a car accident. 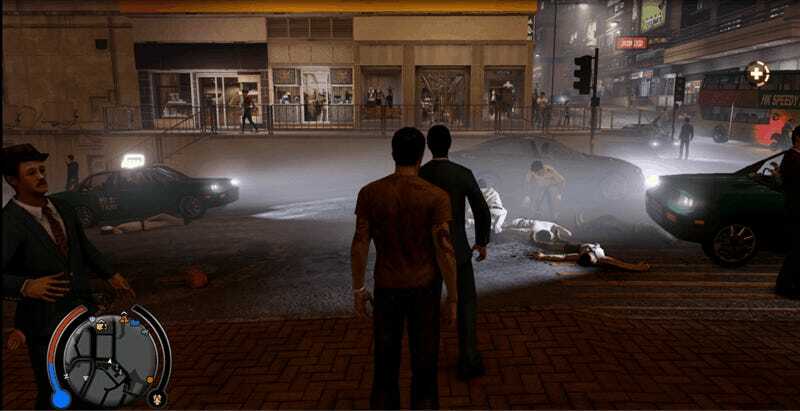 I’ve caused a lot of car accidents in Sleeping Dogs, so I was surprised to see a car hit a pedestrian all on its own. I stopped, curious how the game would respond. Paramedics came careening in, abandoning their ambulance in the middle of the street. A small crowd gathered. The discarded ambulance caused traffic to pile up. Cars honked, drivers yelled, and the observing crowd grew restless. One of the waiting cars swerved around the pile-up and hit a woman who was watching, which made the crowd freak out more. Their agitation seemed to further upset the drivers. Another one abandoned the queue, striking one of the paramedics. Of course these new casualties required new paramedics, who seemed to be worse at parking than their predecessors. Cars and ambulances arrived like vultures. They drove onto the sidewalk and crashed into lampposts, hitting more people, which required more paramedics. Chaos ensued. I would like to reiterate that none of this was my fault. I had even waited for the light. I’m not sure if my presence in the crosswalk had somehow made this happen, or if the NPCs would have slaughtered each other all on their own. Were disasters like these occurring all over the map right now? Would the mess eventually right itself, or would the pile-up continue until I reset the game? These were lofty metaphysical questions, but they’d have to wait for another time. The sun was coming up, and I was no closer to my goal of finding a giant escalator. I went back to the real-world materials I had at my disposal and tried to regroup. Tourist information suggested the escalator went at least in part through Soho, so I decided to head there and try again. Soho seemed a bit far to walk, and I’d wandered pretty far from my bike, so I tried to catch a bus. You can’t ride the bus in Sleeping Dogs. You can only steal it. Beep beep I’m a bus! You’d think the passengers would be grateful to get a free sightseeing tour. They were not. Sick of their griping and their panicked screams as I rolled over parking meters and smaller cars, I abandoned the bus and combed the streets on foot. There were the usual stairways and apartment complexes, nothing that seemed much like a tourist attraction. Plus, the more I poked into the city, the more its cracks started to show. There were food vendors and clothing stalls and locked doors; there were reused textures and the same five businesses. 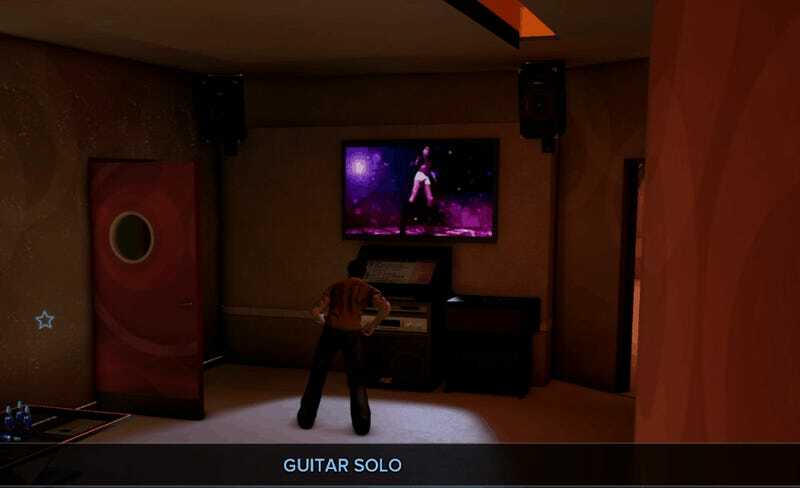 Instead of teaching me new things about Sleeping Dogs’ Hong Kong, my investigation was beginning to show me its limits. Was this it? The stairs had an escalator-like texture, though they weren’t moving. I Googled up some comparison shots. The arrow and the arched overhang were a dead giveaway. I’d found the Central-Mid-Levels escalator, the longest outdoor covered escalator system in the world. I gazed up the short flight of stairs that were definitely stairs and not an escalator because escalators are supposed to move but whatever. How would it compare? The pictures I’d seen of it in real life had a grand but still commonplace sense of scale, both a tool and a landmark. Its Sleeping Dogs counterpart was a little less lively. The escalator went up two short levels, where it entered into a small plaza full of shops and glowing signs. Across the plaza it gave way to a flat stretch to another plaza, then descended to another street not terribly far from where I’d started. I don’t even think it was the longest walkway in the game, much less a model of one of the longest in the world. The escalator lacked the sense of life and utility the photo essay I’d seen had given it. It seemed like a dead bit of landscape rather than a commuter hub, a notable lapse given the chaos I’d witnessed in the street earlier. Where were the malls, the bars, the prime real estate, the tourists? While the escalator’s size was disappointing, there was something notable about it. While neither long nor heavily trafficked, it did seem to draw a certain type of person. Are they in a pretty version of West Side Story? As I ran back and forth along the escalator, more and more versions of this particular woman appeared. One minute she’d be walking alone; the next she’d be in a group of clones. I’m used to seeing reused models in open-world games, but I’d never seen so many in one place before. I kept running into them in surprise. They didn’t like me very much. They poured like a river in their short skirts and jauntily-tied sweaters, talking about shopping and blogging, sharing details of their day with their doppelgangers. It was like a mix between Children of the Corn and Mean Girls. Was it some accident of the code, like the car crash had been, that spawned them all here? Or were they drawn by the escalator? On a subsequent visit I found a confusing number of NPCs with a shriveled leg and only one arm, different faces grafted onto identical bodies that struggled gamely along the escalator’s length. 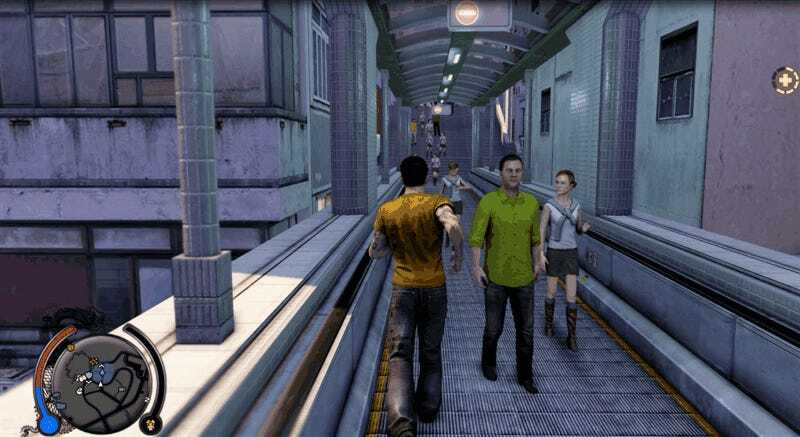 While not impressive in size, Sleeping Dogs’ version of the Central-Mid-Levels escalator impressed me with its ability to be a haven for clones, as if it had bent virtual time and space. Though the escalator wasn’t as big as I’d hoped, it had, in its own strange way, not disappointed. Here’s a video of the whole thing in action, from a different journey than my original one. (The footage from that trip is mostly me crashing into NPCs and them swearing at me, which, while hilarious, isn’t quite the look I was going for). 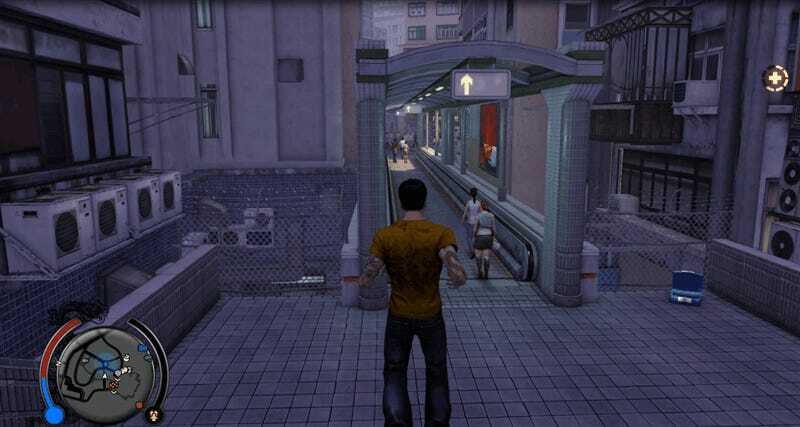 The escalator might not have been impressive, but I had, as I’d hoped, learned more about the life of Sleeping Dogs’ model of Hong Kong. Namely that no one can take a punch, I might be able to cause car accidents by my mere presence, and the game’s version of the Central-Mid-Levels escalator might not be big, but it’s still pretty cool. Clearly it was time to celebrate.